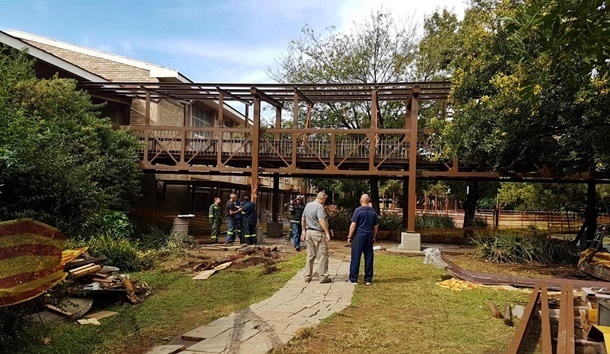 The restoration of a collapsed bridge at Hoërskool Driehoek, which claimed the lives of four students in February, is on track, Gauteng Education MEC Panyaza Lesufi tweeted on Monday. Tragedy struck the high school in Vanderbijlpark when a concrete slab fell on top of 26 pupils, killing four of them and leaving several others injured. News24 reported from the school on the day. An employee at Hoërskool Driehoek, who could not be identified, said she was tormented by the images of the falling concrete slab. She said the tragedy struck soon after 08:00, when pupils left the assembly hall to return to class. She recalled that injured pupils were lying near the pathway, while the bodies of the three deceased were trapped underneath the concrete slab. The restoration of the bridge that collapsed at Driehoek Hoërskool. The concrete slab was above a walkway which linked two buildings at the 45-year-old school. The employee told News24 that she had heard a loud bang, followed by the screams of help from learners still trapped beneath the rubble. "Their screams are still lingering in my mind. They cried, pleading for help. Oh! My children were fighting for their lives. There was nothing I could do. But I am glad and appreciate those men who responded quickly and saved the lives of some of the children. I am hurting inside and don't know what to say anymore," she said. Roydon Olckers, Jandré Steyn and Marli Currie died on the scene. Marnus Nagel succumbed to his injuries in hospital. The school was immediately closed for investigations to take place and counselling services were provided to learners and staff. The school was opened shortly after the tragedy, with sections of Hoërskool Driehoek declared safe for learners.